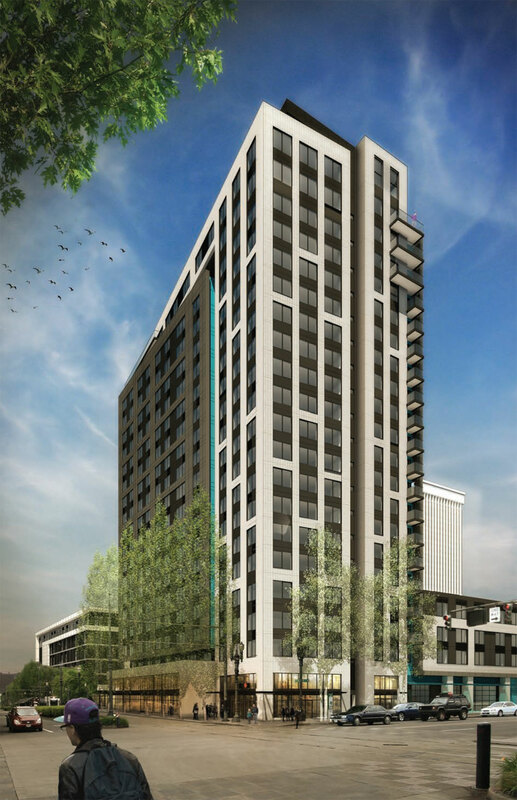 Ankrom Moisan Architects have submitted drawings of a proposed apartment building in the Central Eastside for Design Review. 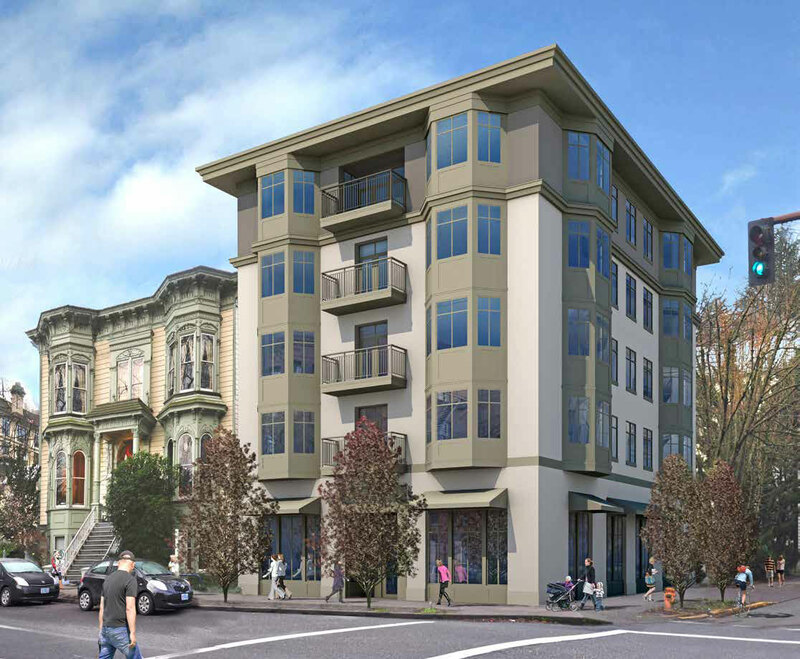 The 6 story building at 915 SE Belmont St will include 105 apartment units over ground retail. 17 vehicular parking spaces are proposed. The project, reported on by The Oregonian in 2013, is by developer Foresight Development & Real Estate, who previously renovated the Grand Central building one block to the west. 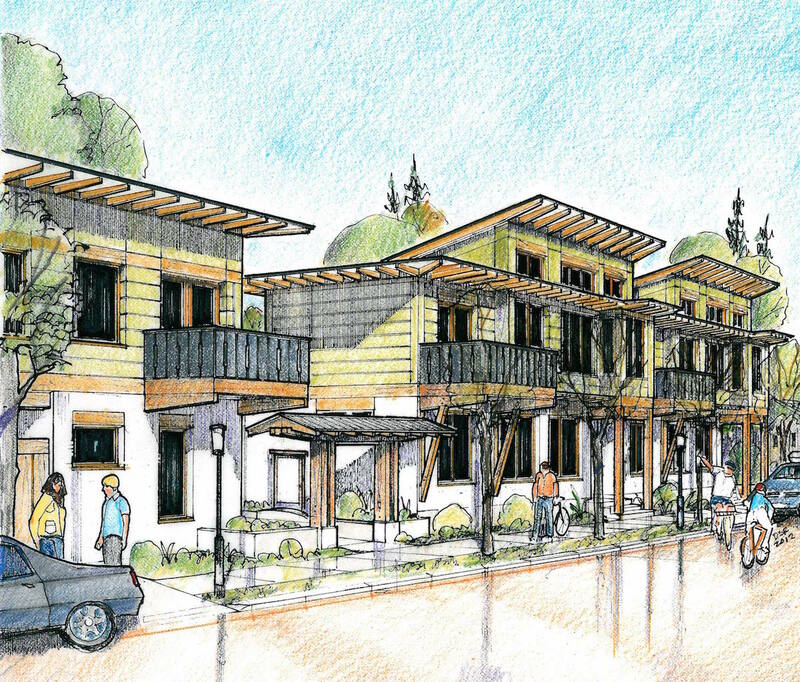 A nearly full block development is under construction in the Boise neighborhood on a site bound by N Williams, N Skidmore, N Vancouver and N Mason. The Peloton will include 268 apartment units and over 26,000 sq ft of retail space. 237 vehicle parking stalls will be located in the basement, split between 52 spaces for the commercial uses and 185 for the residential uses. 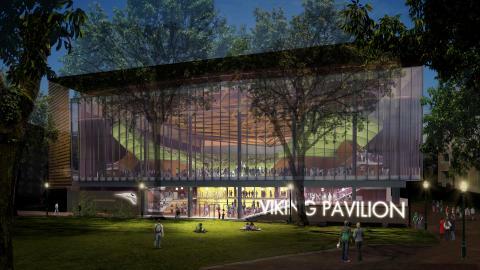 The design of the project is by Myhre Group Architects for Security Properties. The Historic Landmarks Commission has offered Design Advice to Ankrom Moisan Architects for a proposed new Restoration Hardware store on NW 23rd Ave. The proposed store would be modeled on the furniture store’s ‘Gallery’ concept, as used at the recently opened West Hollywood store. Furniture would be display in a series of linked rooms, as they might be in a house. A grand staircase would rise through the three story building, up to a roof deck where outdoor furniture would be displayed. Despite the volume of construction in Portland, citywide apartment rents continued to rise as the vacancy rate decreased. Rents did however fall slightly in Northwest and Southwest Portland. Under Armour announced plans this week to move their Portland operations into the former YMCA building at 2815 SW Barbur Blvd. According to the Portland Business Journal a major renovation of the building will be undertaken by Siteworks Design Build. Cup & Bar, a partnership between Trailhead Coffee Roasters and Ranger Chocolate, has opened in the former Stark Vacuum warehouse at 107 NE Grand. 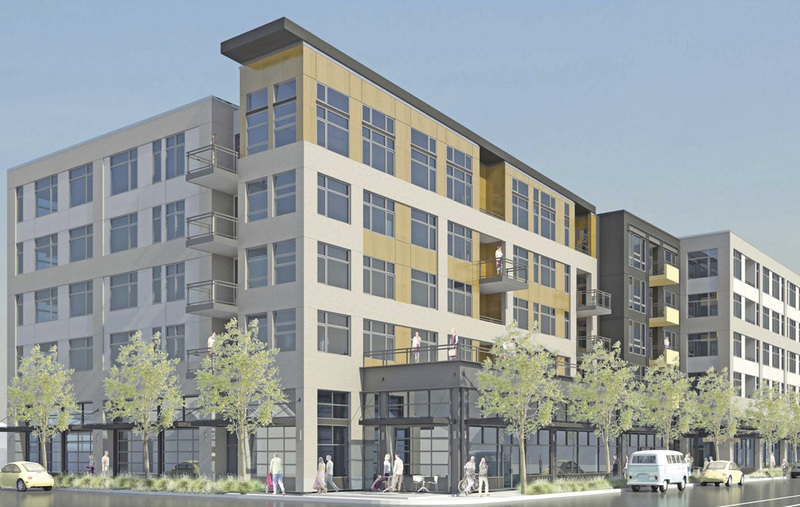 The Oregonian published images of the 4-story mixed use building set to replace the Gypsy Lounge at 635 NW 21st Ave.
Portland Architecture visited the completed Ankeny Row co-housing project. Eater PDX published images of the completed Plaza del Toro event space in the Plow Works Building. 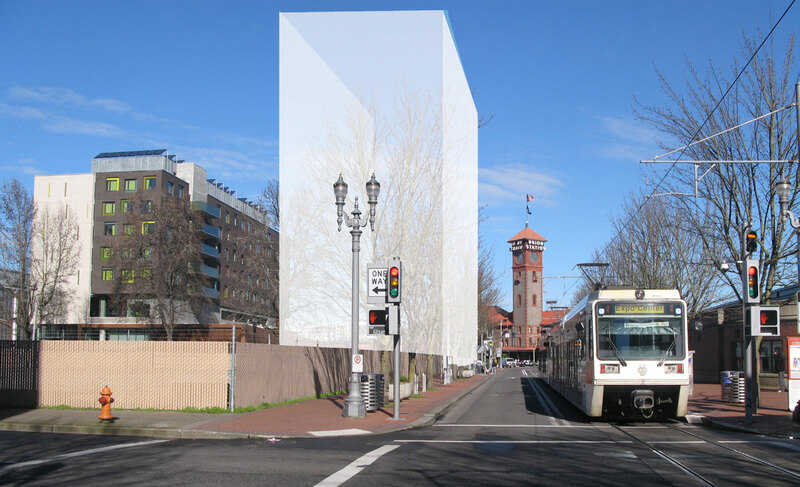 SERA Architects have received Design Advice from the Historic Landmarks Commission for a proposed expansion of the Northwest Portland Hostel. The five story building will include new lodging rooms, with a mix of dorm rooms and private rooms. Proposed ground floor program includes the lobby and reception; a public cafe; and a kitchen and dining area for the use of guests. Three elevational treatments were presented to the Commission for discussion. The approach was generally well received by the Commission, albeit with some concern over height and the impact to the adjacent historic buildings. A Zoning Map Amendment is being proposed for Block U, the proposed site for the new Multnomah County Health Department Headquarters. The change would enable the County to construction a building with a height of up to 150′. The site is currently zoned for 75′ maximum height, which the County believes in inadequate to support the 150,000 sq ft building they are proposing. Current policy is to protect views of the Union Station clock tower from four locations: along NW 6th Ave; from the east bank of the Willamette at N Thunderbird Way; from the Steel Bridge; and from the Broadway Bridge. ZGF Architects have produced a number of images to illustrate the potential impact of a 150′ tall building from any of these designated points. An Economic, Social, Environmental and Energy Analysis by the Bureau of Planning & Sustainability found only minor impacts on the designated resource, which could be mitigated through the mandatory Design Review process and the provision of public amenities through bonuses and/or transfers. This post is the Part IV in a series on Hassalo on Eighth. See also Part I about the masterplan and site design, Part II about the Velomor and Part III about the Elwood. At 21 stories, the Aster Tower will be the tallest building at Hassalo on Eighth, the massive mixed use development by American Assets Trust, GBD Architects and Place Studio landscape architects. 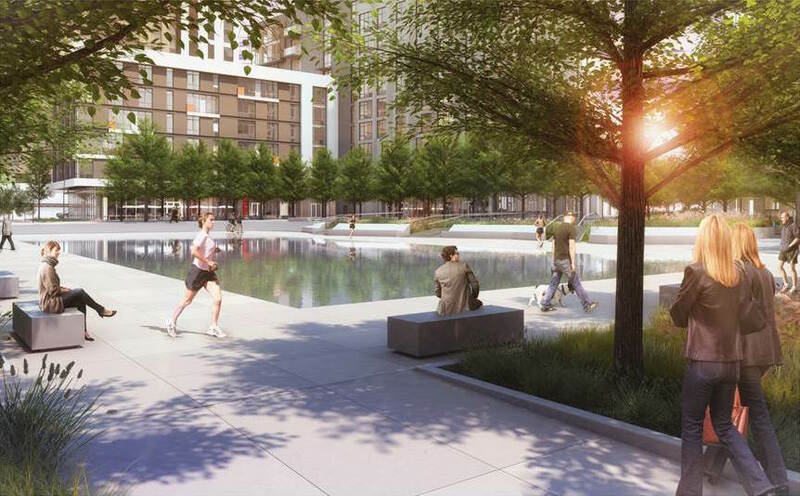 The Aster Tower will include 337 rental units, including studios, one, two and three bedroom apartments, penthouses and walk-up style townhomes. At the ground level the project will include 11,582 sq ft of retail space. Phase 1 of new multi family dwelling structures. 62 dwelling units total. 1 3-story structure on R1 parcel, 2 4-story structures on CG parcel. Ground floor residential with parking and landscaping. 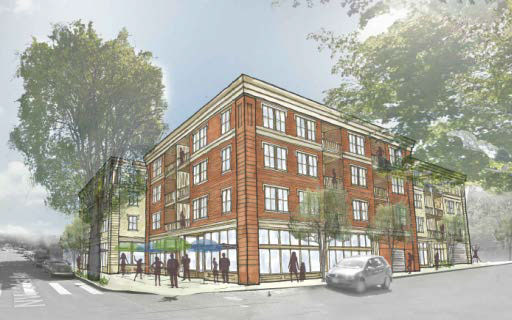 Phase 2 will be new 4-story hostel with 25 dwelling units.